… and they happen everyday. Especially at the New Year. If you want this year to be different, set your intention for it to be so and BELIEVE in it. You can have anything you want in life – if you are clear in setting your intention for it and if you put your faith/belief in it. It’s very simple. Everything is energy and if your energy is clearly directed, and it’s placed with belief/faith, it will yield many gifts/surprises. But if your energy very easily falls into patterns of disillusionment, disbelief and fear of not having enough, then your energy will be blocked and miracles will NEVER happen. Remember, you get what you put your energy into. If you are focusing on the negativity and pain in your life, you will never manifest the love and miracles you desire. Shift your vibration and put that high energy into believing in your ability to manifest your dreams and they will come true for you. Believe in yourself. Believe in the love you have for yourself and know that you are worthy beyond measure of having your own miracles. Every being is worthy of having their own miracles, they just need to get out of their own way in order to bring those miracles to life. Miracles only happen where love, faith and belief are present. Close the door on fear. If you stop believing, you will never see any magic. And it’s definitely the year for magic and miracles. 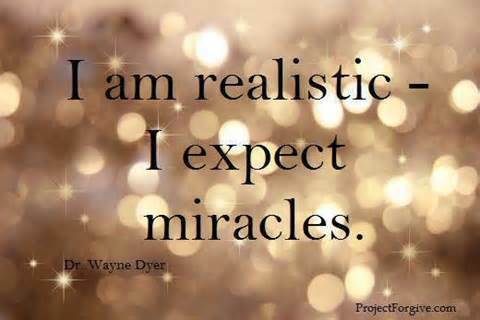 What are the miracles you want to see in your life? It’s your time to shine. Miracles happen… and they happen everyday. Be realistic and expect them. Isn’t it about time?